This week I want to visit with you about scheduling blog tours. Some publishers will take care of this for you, but if not, there are steps you can take to do it yourself. *Taken from a series of articles on the CAN Marketing Blog. The last two years, I have been fortunate to have blog tours scheduled for me by my publisher, but I also took steps to make the most of my influencer spots. I did that by: 1) checking in with those on my influencer list to make sure they received a copy of my new release, 2) making myself available to them for author interviews and other promotion, 3) sending them an email attachment of my author photo/book cover, and 4) offering to give away a book, should they request it. These same steps can be taken when you want to schedule your own blog tour. The first thing you'll want to do is to decide how many books you want to make available for the tour, and then decide what dates you want the tour to take place. Usually, blog tours are scheduled a few weeks after the release date and may run for one or two weeks, though there is nothing wrong with them lasting as long as a month. Once you have the dates, you can begin collecting a list of bloggers interested in helping with promotion. Keep in mind that it is most helpful to seek bloggers whose readership would have an interest in your book. For instance, for my Seasons of the Tallgrass series, I looked for bloggers who had an interest in country living, horses, or ranching. That way, you'll reach your target market when the tour takes place. Another way to find bloggers is through online reader or social groups that you belong to. 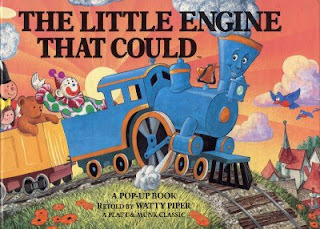 Oh little engine, I don't know if I can do this. Promoting myself this way may be too big of a hill to climb. Yes, it is hard to put yourself out there to people this way, but remember, bloggers are always looking for content they can publish. Most will be more than happy to help you with promotion. Besides, once you reach this step, you're halfway there. The rest is downhill. . .
After you have your list of bloggers, you'll want to prepare items to send to them such as your author bio and photo, your book cover and blurb, links for ordering and for your Web site, and possibly even a "canned" interview with prewritten questions and answers they might use. (Answering multiple interviews can be fun but also very time-consuming, so the canned interview can be a real blessing.) Email these items to your blog tour list, or you could even make the information available to them on a temporary blog. If you're unable to provide extra giveaway books, you may want to inform your bloggers that they are welcome to give away the book you send them, should they want to offer a book drawing for their readers. When it comes time for your blog tour, take time to visit each site and leave a comment for the readers. You will also want to share your blog tour links on your own blog and social sites, and be sure to mention if a book is being offered as a giveaway. Lastly, be sure to show your thanks by sending a personal email or letter to those on your blog tour. It will go a long way to create a lasting and favorable impression. Next Tuesday I'll visit about Writer's Conferences. Until then, keep chugging up those hills . . .